The Worldwide ERC® India Global Mobility Summit 2018 will focus on global mobility, HR, expatriate support, immigration, international taxation and compliance, equipping delegates with new knowledge and business connections. Delegates will have the opportunity to learn from in-depth presentations, contribute to interactive roundtable discussions and engage in personal networking, enabling them to take on the challenges of talent mobility and cross-border team-building with new skills and an enhanced network of support. 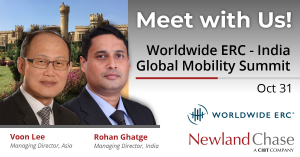 Newland Chase’s Managing Director of India, Rohan Ghatge, and Director of Operations for Newland Chase Asia-Pacific, Voon Lee, will be exhibiting.